When it comes to building a garage, there is more involved than many of us may consider. That is where Economy Garages really shines! Checkout some of the most common questions we receive and then give us a call at 800-837-5506 to learn more. Why Build a Wood Garage? At Economy Garages, we believe you get a better fit with your existing home by using wood, there are other important reasons why we feel wood is superior. We will visually assess your property and discuss specific issues as it relates to making the proper space concessions for your new garage. We may suggest land alteration processes such as skid steer use in leveling and tree removal in preparation for your building. This aspect of the project can incur additional costs not covered in the base price of the building construction. By dealing with Economy Garages, you can rest assured the ground preparation will exactly what is needed to ensure you have a sound building site. 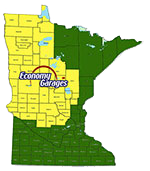 Economy Garage provides comprehensive services to help you avoid unfamiliar situations. Building permits, plan drawings and measurements can all be intimidating to the home owner. For this reason, Economy Garages provides advice on how you can obtain your building permit for your project. This will save you headaches and ensure all aspects are done legally and correctly.